Everyone wants beautiful skin, but achieving it can be difficult. Luckily there are many natural aids that can help bring about beautiful skin and good health. Commercial products contain numerous types of active ingredients that are effective at producing great results. However, just because these ingredients can even out skin tone, eliminate acne blemishes, soften the look of wrinkles, and boost skin cell renewal doesn't mean that they do not come with a few unwanted side effects. Many of the harsh chemicals or additives in commercial skin products can cause allergic reactions. Some ingredients can cause acne, redness, dryness, and inflammation for some individuals, especially those with sensitive skin. If you use natural aids and products however, you can avoid these reactions and still attain beautiful skin. Another reason many individuals choose natural aids during their hunt for beautiful skin is because they have made other natural choices in their everyday lifestyles. Natural aids fit better with a lifestyle devoted to natural foods, natural cleansers, and a more natural way of life. Finally, the use of natural aids can be easier on your budget. Expensive creams, soaps, and other beauty aids might produce the desired results but the cost makes their use impossible. 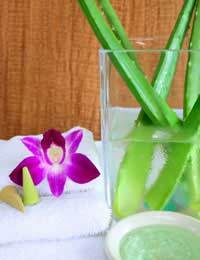 With natural beauty aids the cost is often low and the rewards for your skin great. To get the most out of a beautiful skincare routine you must first understand that the term natural aids does not just apply to skin care products. Natural aids also include diet and exercise. For the healthiest skin possible, individuals should concentrate on eating a healthy diet full of fruit, vegetables and plenty of water. The water, vitamins, minerals, anti-oxidants, and other nutrients found in fruits and vegetables can help you achieve great looking skin from the inside out. Your skin is a living, breathing organ of the body and when it is lacking sufficient nutrition it is unable to perform flawlessly. Feed your skin for health and it will reward you with a clear, smooth, youthful appearance. Although consuming a wide variety of fruits and vegetables is important, you also need to keep your skin thoroughly hydrated if you wish to avoid dry skin, blemishes, and other skin problems. Water helps your skin cells remain active, increases skin cell renewal, eliminate toxins that can led to breakouts, and helps plump up facial tissue for a smoother, line-free appearance. Get the best skin possible by drinking at least eight glasses of water each day. For added flavor and nutrition you can add a little juice, a few cucumber slices, or some whole berries to your glass. Another great natural aid for beautiful skin is exercise. The act of exercising reduces stress (which can lead to breakouts, shallow skin coloring, and tired looking skin), increases circulation (which means more nutrients reach your skin where they can be put to good use), helps the skin eliminate toxins (through sweating), firms the muscles under the skin (which leads to less sagging and fat accumulation), and increases REM sleep patterns (which give your skin a chance to renew and rejuvenate itself on a daily basis). Once you have incorporated the first three natural aids into your skin beautifying routine it is time to delve into the world of herbs of and essential oils. Herbs and essential oils can help relieve dryness, reduce inflammation, heal acne breakouts, even out skin color, and bring out the glow of health. The most effective herbs and oils for beautiful skin are bergamot, basil, yellow dock, chamomile, black alder, dandelion, sarsaparilla, and burdock. These oils and herbs can be steeped into a tea, added to cleansing baths, mixed in with moisturising lotions and creams, or used as compresses to address certain skin problems like acne. These herbs and oils can be purchased at health food stores and include instructions for safe and effective use. However, if you do not have the time to concoct these aids at home you can purchase commercial products that contain them. Due to the growing consumer interest in natural products, natural lifestyle choices, and natural aids, many major skin care manufacturers have begun offering natural aids for beautiful skin. These products forgo the usual synthetic, chemical, and man-made ingredients found in common products and opt instead to use natural substances like herbs and essential oils. If you are searching for natural ingredients but still want beautiful skin look for commercial products that use sesame, avocado, grape seed, jojoba, or coconut oils as their cream or lotion bases. Next, choose products that use the previously listed herbs and essential oils as their active ingredients. Finally, look for products and aids that list the words "natural", "organic", or "pure" on their labels. By taking a natural approach to your skin care routine you can achieve beautiful skin in a safe and holistic way without risking unwanted side effects.